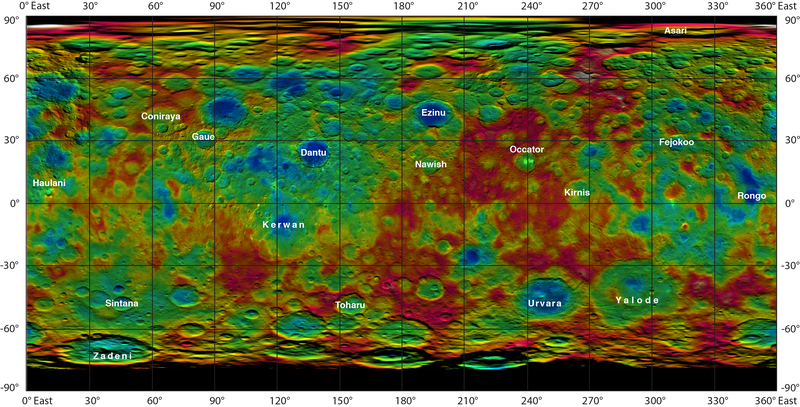 July 28, 2015 – Colorful new maps of Ceres, based on data from NASA’s Dawn spacecraft, showcase a diverse topography, with height differences between crater bottoms and mountain peaks as great as 9 miles (15 kilometers). 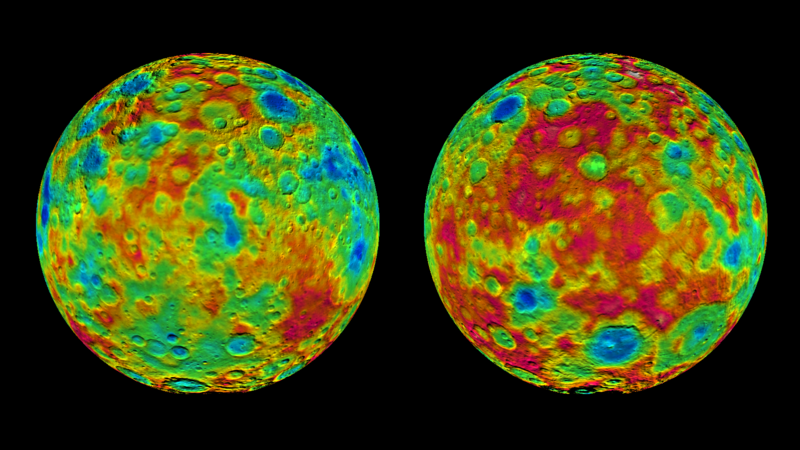 “The craters we find on Ceres, in terms of their depth and diameter, are very similar to what we see on Dione and Tethys, two icy satellites of Saturn that are about the same size and density as Ceres. The features are pretty consistent with an ice-rich crust,” said Dawn science team member Paul Schenk, a geologist at the Lunar and Planetary Institute, Houston. The newly labeled features include Occator, the mysterious crater containing Ceres’ brightest spots, which has a diameter of about 60 miles (90 kilometers) and a depth of about 2 miles (4 kilometers). Occator is the name of the Roman agriculture deity of harrowing, a method of leveling soil. A smaller crater with bright material, previously labeled “Spot 1,” is now identified as Haulani, after the Hawaiian plant goddess. Haulani has a diameter of about 20 miles (30 kilometers). 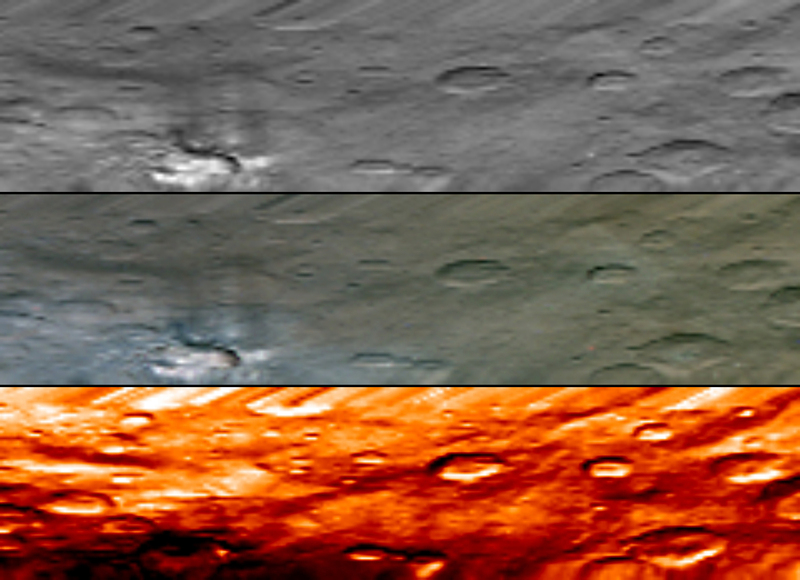 Temperature data from Dawn’s visible and infrared mapping spectrometer show that this crater seems to be colder than most of the territory around it. “The impact craters Dantu and Ezinu are extremely deep, while the much larger impact basins Kerwan and Yalode exhibit much shallower depth, indicating increasing ice mobility with crater size and age,” said Ralf Jaumann, a Dawn science team member at the German Aerospace Center (DLR) in Berlin. Ceres, with a diameter of 584 miles (940 kilometers), is the largest object in the main asteroid belt, located between Mars and Jupiter. This makes Ceres about 40 percent the size of Pluto, which NASA’s New Horizons mission flew by earlier this month.